Nothing like a deadline! It became obvious on social media the past couple days that I was in good company with many other quilters finishing up (or, in the case of some, just starting) our QuiltCon submissions for tonight's 10pm PST deadline. 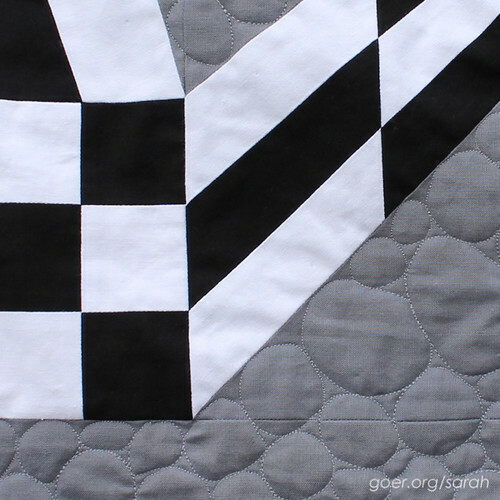 Here's my sneak peak of my quilt (full reveal when I blog about the entire project), Perspective, which I submitted for the American Patchwork & Quilting Nine-Patch Challenge. I enjoyed playing with the geometry of a nine-patch by piecing skewed blocks. Then I had this wonderful recommendation (I'm looking you, Sarah N.) to pebble the background. I estimate I spent about 13 hours over the past two days to pebble the quilt. (My arms are so sore... so it totally counts as a workout, too, right?) I'm very pleased with the results of those marathon quilting sessions. And I'm feeling quite confident with pebble quilting now! I also submitted my Retro Trailer mini quilt. Thanks for visiting! Happy sewing! Posted in Quilting. 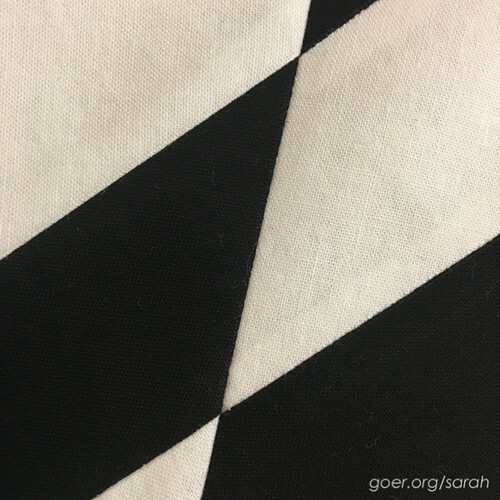 Tags: challenge quilt, lap quilt, nine-patch, Perspective, QuiltCon, sneak peek, WIP Wednesday on November 30, 2016 by sarah. I'm thankful that my mom taught me to sew, so long ago that I don't even remember learning. I'm thankful that creativity was valued and cultivated in my childhood. I'm thankful that my quilting is something that helps me find balance in my life. 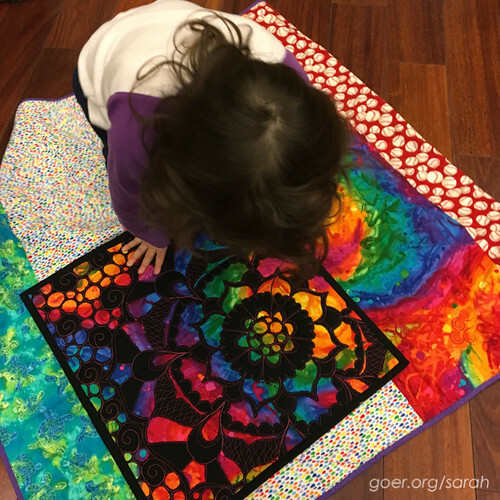 I'm thankful that my kids share my love of quilting. (Photo above: I took them to see my friend Mel Beach's Challenge Yourself lecture and trunk show and my daughter enjoyed the fact that Mel used the same fabric in her mini quilt that R had used on the back of her own quilt.) I'm thankful for the countless quilters and artists who inspire me, both at my guilds and online through blogs and Instagram. I'm thankful for the individuals in the online quilting community who I'm able to connect with through blogging and Instagram. In a month that has been very hectic for me, I am thankful for those few minutes when I can sneak away to the sewing machine. I've made the smallest of progress on this project which I hope to finish in time to submit to QuiltCon. Posted in Quilting. Tags: WIP, WIP Wednesday on November 23, 2016 by sarah. Sometimes WIPs don't exactly align with our current priorities. Sometimes we fall out of love with a project. Sometimes a project was really about learning a skill and once that skill was learned, the project no longer seems relevant. Regardless of the reason, it makes sense to reassess the project list from time to time. Have I already learned what I need to from it? Is it in the style I'd most like to be known for? Then I looked through my list again and considered my answers. There are 12 projects I hope to finish this quarter. (I recognize that this is a really big, crazy goal.) So far I've finished four quilts, so I'm technically kind of on track (though they were the four smallest projects!). I'm sending another one out to a long arm quilter. That still leaves many to choose from when looking to trim the fat in the 33 quilt WIP pile. These three will be the first to go. 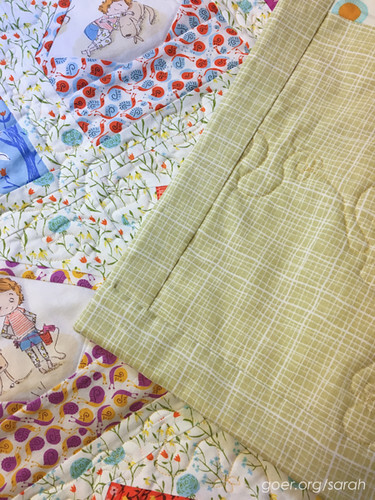 All three of these projects will be donated to philanthropy at the Bay Area Modern Quilt Guild. They've already left the sewing room. Yay, progress! 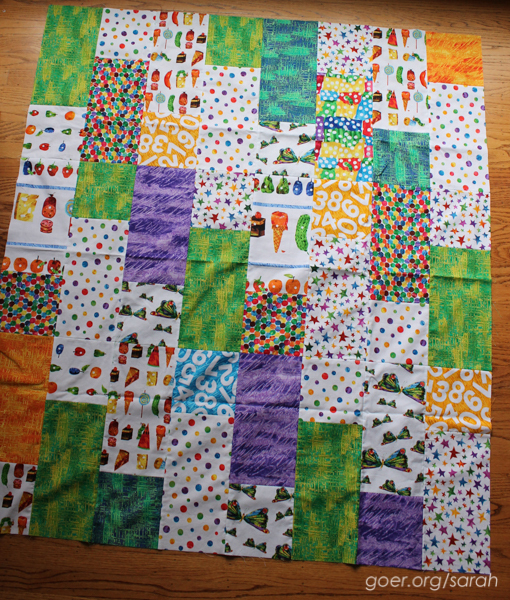 On the bottom of the pile is a Very Hungry Caterpillar quilt top that has been finished since January. 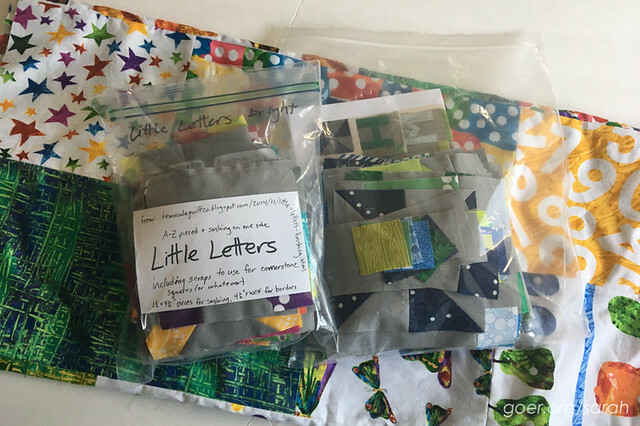 The two bagged projects are from the Little Letters tutorials from Temecula Quilt Company. 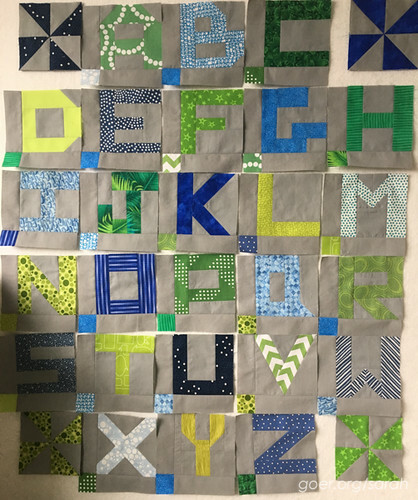 The blocks are all made for both sets (one in bright colors, one in blues and greens) but neither project has a recipient. It should honestly be pretty quick to finish the quilt tops which is why I couldn't part with it previously, but there are just so many projects with a higher priority for me. And I'd much rather see these finished and donated. I included notes with each of these kits, as well as the link to the finishing page of the tutorial. It'll be up to the new makers whether they finish them as I had intended or reimagine the projects. I look forward to seeing how they turn out. Here's the current state of the blue and green project. Also in the interest of cutting back, I've decided I won't be participating in any quilt bees in 2017. That leaves just this month in do. Good Stitches (where Jaime has chosen a rainbow variation of my Watermelon Plate block) and two months in The Bee Hive. 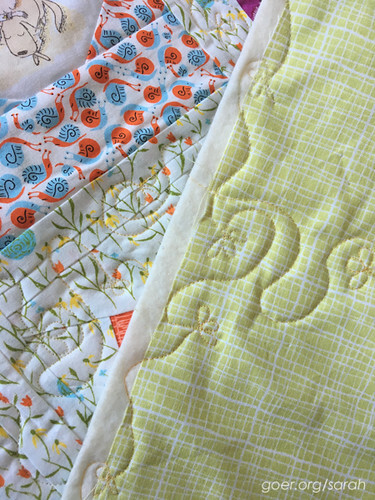 For October, Laura chose the Quatrefoil block in The Bee Hive swarm Tisha, and her inspiration was water lilies. The background of the block has become the water, with a center flower and leaves on the corners. The flowers are a variety of water lily colors (pink, purple, white, yellow). I love this variation with the blue background instead of white. I wonder if Laura will fill in with some solid blue blocks mixed in with the lily blocks like you would see open water between the flowers in nature. I was unwilling to rip out quilting stitches, so it was time to get creative. Sadly, it was too big to be covered by normal binding. So I decided to do a faced binding, a way of binding the quilt that doesn't show from the front. I've been wanting to learn this new technique for a while, and while I was considering a regular binding I couldn't decide what fabric to use. Faced binding was the perfect solution. My friend Mel pointed me to this tutorial by Victoria at The Silly BooDilly. It was easy to follow and I took Mel's advice to press the 1/4" seam before attaching the binding strips. (I ignored her advise to glue baste out of laziness. ;-)) The faced binding did involve hand stitching to sew down the binding on the back, but that step went pretty quickly. Here's a view of the back. Thank you for visiting. What are you working on this week? Posted in Quilting. 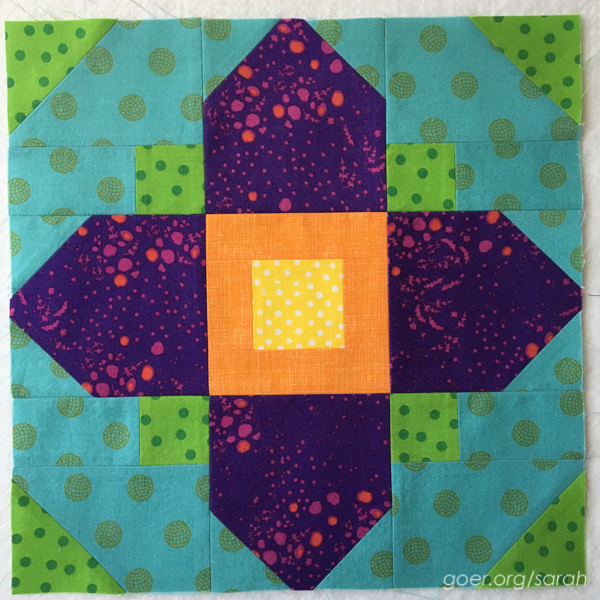 Tags: bee blocks, WIP, WIP Wednesday on November 2, 2016 by sarah.